AUTO JE TEK UVEZEN IZ NJEMAČKE I NALAZI SE U PERFEKTNOM STANJU. AUTO JE DEFINITVNO JEDAN OD LJEPŠIH NA PIK-U, IZUZETNO MARKANTNOG IZGLEDA. 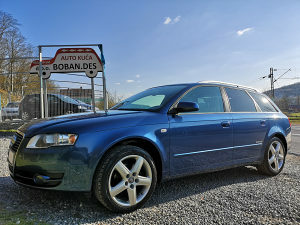 BOGAT PAKET OPREME, SERVISNU KNJIGU, DVA KLJUČA, ODLIČNE ORGINALNE AUDI ALU FELUGE SA EKSTRA GUMAMA. CIJENA VOZILA JE DO REGISTRACIJE ZNAČI CARINA I PDV SU PLAĆENI. AUTO KUĆA BOBAN.DES SE BAVI UVOZOM AUTOMOBILA IZ NJEMAČKE I PRODAJOM ISTIH ŠTO ZNAČI DA ZAMJENE NE DOLAZE U OBZIR.